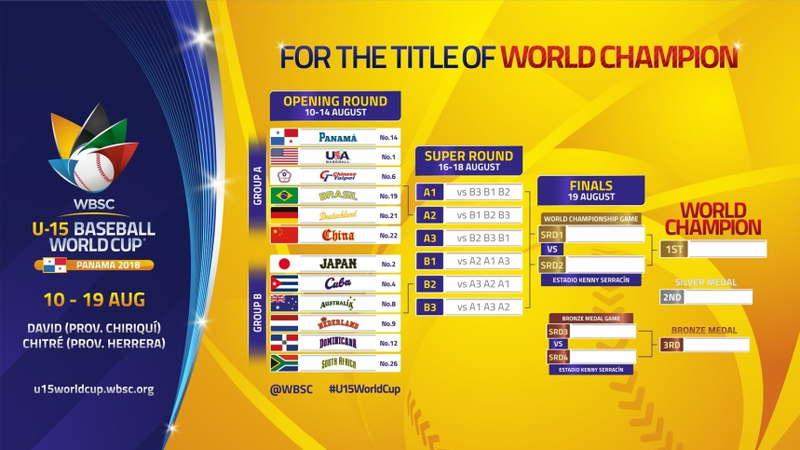 LAUSANNE, Switzerland -- 25 June 2018 -- The World Baseball Softball Confederation today unveiled the Official Game Schedule of the IV WBSC U-15 Baseball World Cup® 2018, to be staged from 10-19 August in the Panamanian cities of David and Chitre. The world's top tournament in the U-15 youth category and Official World Championship -- which will feature the world's best baseball players born in 2003-2005 -- will be contested over 50 games and in three stages: Opening Round (group stage/round-robin), Super Round and World Championship Medal Round. "These 50 games of the IV WBSC Baseball World Cup in Panama will determine which nation possesses the best U-15 baseball team and players on the planet," said WBSC President Riccardo Fraccari. "This global tournament -- with nations participating from all corners of the earth -- also showcases our sport's geographic footprint, connection to youth and bright future of hitting one billion players, fans and followers by the next decade." Nations in Group A -- host/No. 14 Panama, No. 1 United States, No. 6 Chinese Taipei, No. 19 Brazil, No. 21 Germany and No. 22 China -- will begin the global competition For the Title of World Champion at the new US$ 16 million, 8,500-seat Estadio Kenny Serracín in David (Province of Chiriquí). Nations in Group B -- No. 2 Japan, No. 4 Cuba, No. 8 Australia, No. 9 Netherlands, No. 12 Dominican Republic and No. 26 South Africa -- will battle at the 3,000-seat Estadio Rico Cedeño in Chitré (Province of Herrera). •	Game 1: South America's Brazil and European U-15 champion Germany will meet to open the youth World Championship. •	Game 2: Asia and Oceania's U-15 continental champions -- Japan and Australia -- will collide. •	Game 3: Wild card China will make its U-15 Baseball World Cup debut against Americas U-15 co-champion USA. •	Game 4: European U-15 runner-up Netherlands will face two-time defending U-15 World Champions Cuba. •	Game 5: Americas U-15 co-champion Dominican Republic will meet Africa's top baseball nation, South Africa. •	Game 6: Host Panama will open with the Asian continent's U-15 runner-up, Chinese Taipei. Following the 30-game Opening Round, the top three finishers from Group A will battle the top three finishers from Group B in a three-day Super Round at David's Estadio Kenny Serracín. The 7th-12 Place Consolation Round will be staged at Estadio Rico Cedeño in Chitre.